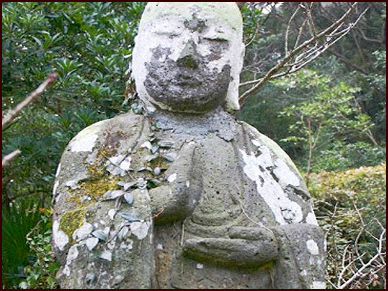 Shōganji Zen Retreat is a 600-year-old Zen Buddhist temple site of historical significance in the region. Currently headed by Rinzai Zen monk, Jiho Kongo, Shōganji opened it’s doors to the public in 2004 in order to allow foreigners to experience authentic Zen temple life in rural Japan. This modest little temple is located in the tiny village of Ojuki, part of the Saganoseki village cluster, only 30 minutes from Oita city. The temple site itself and some of its artefacts are more than 600 years old, and have been held by the Kongo family for more than 100 years. Simplicity, authenticity, and quiet beauty best describe Shōganji. It is a way of life, rich in spirit and culture. Surrounded by beautiful bamboo forest and only a 5-minute walk from the beach, this idyllic location is the perfect setting to meditate, study Zen, or just experience traditional Japanese village life. The informal and relaxed setting, as well as the small number of guests, allow for a uniquely personalized experience. Japanese cooking lessons, Japanese calligraphy, Zen study and koan, green tea ceremony, hiking, swimming, “onsen” hot spring bathing visits, yoga, gardening, participation in Buddhist festivals, participation in local cultural events, regional sightseeing, and shopping excursions are just a few of the regular activities offered at the retreat. Guests are strongly encouraged to get involved in on- and off-site activity planning, meals, etc. The friendly seaside village community of Saganoseki is famous for its fishing, as well as it’s rice fields and speciality citrus groves, all stretched between lush scenic mountainsides. The peaceful location is ideal for long mountain hikes, endless beach-combing, or simply enjoying a slower pace of life. In the warmest months from May to September, the beach is perfect for swimming. The region also features numerous onsen hot springs, with the highest concentration of natural hot springs in all of Japan in nearby Beppu. Shōganji is deeply tied to the local community and hosts both Japanese and foreign guests. A small number of guests is always our preference – allowing us to maintain a relaxed and intimate retreat environment most days of the year (with the exception of a few major Buddhist festival days). You will most likely have the opportunity to visit with local temple members or other Japanese monks. On the other hand, if silence and solitude are golden to you, these desires are easily fulfilled. Shoganji is not a monastery. It is, rather, a fully functional Zen Buddhist temple serving about 70 families in the area. It has only one full-time monk (Jiho Kongo). It’s pretty quiet most days, but regularly serves as a community centre for various important dates on the Buddhist calendar and Buddhist services. Our affordable rates include food, lodging, and all on-site activities.